The internet rumor mill is abuzz with information that the upcoming Legend of Zelda will be a direct sequel to Majora's Mask (and if so, then the beloved Ocarina of Time as well). In the games industry, there are two types of rumors: There are rumors with some credibility to them that can come from trusted, reliable sources ("The PS3 will see a price drop in August alongside the introduction of a Slim revision") and there are rumors that the internet seems to stir up out of the sheer unbridled imagination of diehard fans ("The next Grand Theft Auto will take place in FF7's Midgar, ZOMG!"). As Joystiq says, these rumors are the latter - so take these with far more salt than you would take usual rumors. Like, an entire can of anchovies' worth of salt. Information surfaced on Japanese message board 2chan (yes, the precursor to a certain Western language image board with a similar name but a slightly higher number) surrounding the upcoming Legend of Zelda, slated to be revealed at this year's E3. It's true that 2chan has been right on rumors before - considering its massive popularity in Japan, this entirely surprising - nailing leaks on multiple Square-Enix RPGs, Metal Gear Solid 4, Resident Evil 4 and 5, and (according to Zelda Informer), leaking information about The Wind Waker's plot two months prior to its release. Even so, though 2chan has been accurate before, we do have to stress that these are absolutely uncorroborated rumors originating from an online image board, so make of them what you will and don't go shouting them as the Gospel Truth just yet. â€¢ The game's mechanics/swordplay/gameplay are finished, and the team is now working on the story and the game's dungeons. Part of the story will focus on an innkeeper in Link's hometown and her young son, who looks up to our green-clad protagonist. â€¢ The girl in the teaser picture seen here may be either named Adelle, Aderu, or Adella (thanks, Japanese-to-English translation difficulties), though the image in the picture is not her actual face, since this was just concept art. She won't be with Link the entire time, but she'll communicate with him through his sword (in other words, more like the King of Red Lions in Wind Waker than like Midna in Twilight Princess). â€¢ Speaking of the sword, Link may not be getting the series' traditional Master Sword after all. Instead, his weapon will develop and unlock further abilities as the game progresses. â€¢ Mounted combat will be returning, and the horse (referred to as Epona, but that may just be a fan placeholder) will be much more intelligent when it comes to avoiding obstacles. 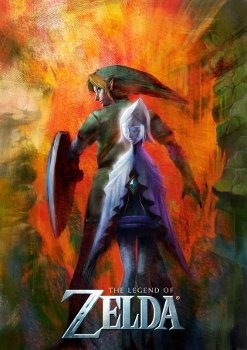 â€¢ The game will not take place in Hyrule, but will feature Link as the Hero of Time - also known as the Link that was the protagonist of Ocarina of Time and Majora's Mask (presumably, grown up after being turned back into a child at the end of OoT and adventuring in Termina during Majora's Mask). Time travel will again be involved in some shape or form. Phew. Some of those are doozies, huh? Again, none of this is confirmed in any way, shape or form whatsoever, so don't go assuming that this is all accurate - though one can't help but wonder if it fits into what we already know about the game. While some are expecting this mystery Zelda to be unveiled at the upcoming GDC as was Spirit Tracks, I'm still sticking with Iwata's statement that it'll show up at this year's E3. Both Iwata and his American counterpart, Reggie Fils-Aime, have said that the game is due by the end of the year. Are we excited? Or perhaps dismayed?